When the World's Most Break-Resistant Stemware reflects the art deco style of the 1930s, the result is glamour for your table. Column-like stems, exquisitely faceted, culminate in the crown jewel of these Champagne glasses: a diamond-shaped capital topped by a graceful bowl. Use for serving martinis, sorbets, and puddings, too! When the World's Most Break-Resistant Stemware reflects the art deco style of the 1930s, the result is glamour for your table. Column-like stems, exquisitely faceted, culminate in the crown jewel of these Champagne glasses: a diamond-shaped capital topped by a graceful bowl. Use for serving martinis, sorbets, and puddings, too! Lead-free European crystal is fused with magnesium for elegance and strength. Never dulls or fades. Dishwasher safe. Is this real glass? If so how is it unbreakable? BEST ANSWER: Thanks for your question. This is real glass. However it is much harder to break than other glasses on the market because it has a magnesium compound that helps make up the glass. This makes the glass stronger. It is not unbreakable. If you have any other questions please call us at 800-356-8466. Is this a very thin rim? BEST ANSWER: It depends what you would call thin. It is about 1/24th of an inch. Can I purchase one replacement glass? Delivery was very quick and they arrived in perfect condition due to excellent packing. I returned these glasses. I was looking for something elegant and traditional for serving Champagne. The coupe was huge and looked more like a fancy ice cream dish than an antique champagne coupe. You could also see the seam in the glassware and they were clunky looking and not elegant. Also, very heavy. I liked the retro feel of these glasses. We rang in the New Year with our neighbors drinking champagne from these glasses. Everyone commented on how pretty they were, and they hold a fair amount. Can't wait to use them for some creative desserts. Only complaint - I ordered 12, but one glass arrived broken. Waiting for my replacement now. Louisiana Lady - Geaux Tigers! Great for sipping Champaign or speciality cocktails. These glasses are similar to the ones used in the early 1900's. A lot of films show people using these glasses, I thought that it would be fun to utilize them as well. I am all about nostalgia, and these glasses saay it all. Love these champagne coupes, I gave them as a gift but wanted to keep them for myself. These are a fun alternative to regular champagne flutes. Could also be used to serve cocktails. Makes a Manhattan Taste Better! The design of these glasses is beautiful and the weight and balance of the design makes it comfortable to hold. It makes the taste of a Manhattan better - and that is saying a lot!! just what the wine steward ordered, great glasses, really seem to make Champagne more flavorous and festive. Great customer service. A pleasure doing business with you. Wonderful shape of the glass. So much easier to sip from than the flute. I find the glass too thick. Miss the crystal look and sound. Great for when you want a retro feel to your glass of bubbles, also excellent for champagne cocktails. Makes for a stunning display of certain courses, as well. 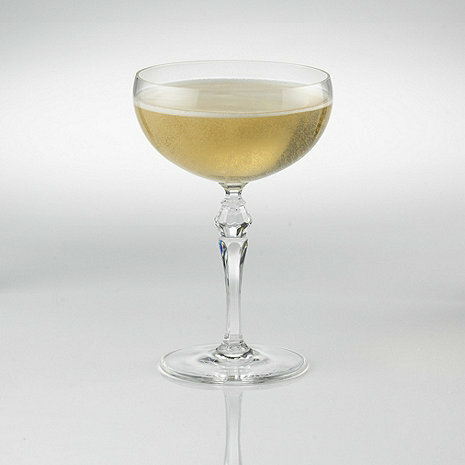 A very nice, elegant wide mouth champagne glass. Great glass. I use it for cocktails and it’s been a nice glass. Looks more expensive than it is. I bought these glasses in an act of desperation after failing to find a champagne coupe at local stores for months. While I was not prepared to spend hundreds on a single coupe, this set was well below my pain threshold, so I bought it figuring that it will do while I continue my search. The break-resistant glass looks like break-resistant glass does, but the glasses were quite affordable and look just about as good as the price suggests. I have put them in the dishwasher and they came out fine. These glasses will work just fine for casual dining or entertaining, but I will continue the search for those special-occasion coupes.